Extremely easy to grow. Golden pothos is a popular house plant well known for its long, trailing stems that can grow to 8 ft (2.4 m) or more. Cut stems back a couple times a year to keep the plant bushy and full. Cutting right after a leaf node (the place where the leaf is attached to the stem) will encourage the stem to branch out, giving you a fuller plant. Glossy, heart-shaped leaves emerge green and become variegated with yellow or white. Although this plant tolerates low light well, its leaves may lose their variegation. It will look its best in moderate or bright light. It makes an excellent office plant because it grows well under fluorescent lights. 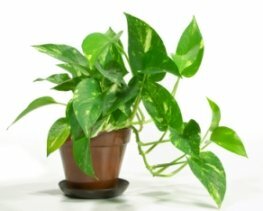 Pothos is one of the best plants for removing formaldehyde in the air that comes from carpet and other materials in our homes. Beautiful, low-maintenance, and cleans the air. What's not to love? Show off those beautiful trailing stems in a hanging planter. Or you can train it to climb. A tree-climber in its native tropical habitat, this plant has aerial roots that can be trained to climb a moss stick or trellis. Use florist wire to hold the vines while they grow and wrap themselves around the support. Repot in spring as needed. You can control its growth by cutting the vines back and trimming up to a third of its roots. Pot it in the same size container to keep it small. Leaves are mostly green. Leaves will lose their variegation when they don't get enough light. Keep your plant where it will be exposed to bright, indirect sunlight. If your plant is unfurling new leaves that are solid green, don't worry. That's normal -- they'll become variegated as they age. Stems are leggy with few leaves. Stems that are allowed to grow longer than 4 ft (1.2 m) often shed most of their leaves near the base of the plant. It's a good idea to trim off long stems once in a while to keep pothos leafy and full. Stems that are mostly bare can be cut off at the soil level. Wilted leaves. Wilting is caused by dry soil. Although this plant will quickly bounce back after a good drink, water regularly. Yellow leaves and/or stems. Overwatering is about the only thing that will kill Epipremnum aureum. Allow soil to dry out a bit between waterings. Are the stems yellow and mushy? That's a symptom of root rot. Your plant may be too far gone. If any of the stems are still green and healthy, propagate stem cuttings for new plants and discard the dying plant and soggy soil. Fungus gnats love wet peaty potting mixes. You'll find these tiny black fly-like insects crawling on the soil. Find out how to get rid of fungus gnats here. Choose a plant based on your preference because they're all easy to grow. 'Golden Pothos' (shown at bottom) is a popular cultivar variegated with yellow. 'Marble Queen' is handsomely splashed with white and 'Neon' has bright yellow-green leaves. Light: Low light to bright light. No direct sun. 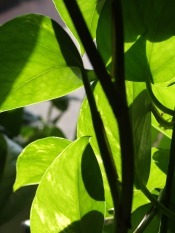 Although pothos will tolerate low light, it will have more leaves and better variegation if kept in bright light. Water: Allow the top 1 in (2.5 cm) of soil to dry between waterings. It will not tolerate soggy soil. Overwatering will cause leaves to turn yellow and fall off. Use a pot with a drainage hole. Humidity: Average room humidity (around 40% relative humidity) or higher. Brown leaf tips are caused by low humidity. Discover easy ways to raise the humidity for your house plants. Temperature: Average to warm 65-80°F/18-27°C year-round. Soil: Good-quality all-purpose potting mix. Propagation: Stem tip cuttings root easily in water or moist perlite or vermiculite. Cut a 4-6-inch stem tip with a couple leaves attached. It takes at least 4 weeks to root.